Call the Parks and Recreation Department (located at the City Arena, 701 Lake Chapeau Drive) for pavilion reservations. Reservations are taken at the Parks & Recreation office and fee paid for at that time. Reservations can be placed over the phone using Mastercard or Visa. This is the time to make your reservations for summer and fall picnics, family reunions or get-togethers for your church, friends, or club. Rental Rates: All rentals are subject to 7.875% sales tax. Non-profit agencies may rent facilities at half price, weekdays only, you must show proof of being a non-profit. Click here for rental brochure. Pavilions at Edgewater Park: Large Pavilion (Pavilion #1) (North & South) $25/hour – in town; $30/hour – out of town. 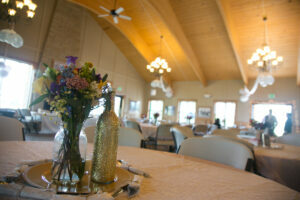 Edgewater Bay Pavilion: Accommodates approximately 175 people. Hot and cold running water, restrooms, fireplace, kitchen with refrigerator, stove and microwave. $45.00/hour – in town, $50.00/hour – out of town ($700.00 + tax all day – 8:00am – midnight – weddings only) plus $100.00 returnable deposit for the key and $200.00 cleaning deposit. The key must be returned the next day with a week day rental and the following Monday with a weekend rental. Cottage at Edgewater Park : Seats 96 people (48 inside and 48+ outside). Hot and cold running water, rest rooms next door, fireplace, kitchen with refrigerator, stove, oven, and microwave. $30.00/hr. – in town; $35.00/hr. – out of town; $100.00 key deposit; $200.00 cleaning deposit. Bandshell at Edgewater Park: $30/hour – in town; $35/hour – out of town. Gazebo on Fountain Lake: $30/hour – in town; $35/hour – out of town. Pioneer Park: with kitchenette $20.00/hour – in town; $25.00/hour – out of town (plus $100.00 returnable deposit for the key) (and $100.00 cleaning deposit) without kitchenette: $15.00/hour – in town $20.00/hour – out of town. The key must be returned the next day with a week day rental, and the following Monday with a weekend rental. Cancellations must be made 30 days prior to reservation date to receive a refund. Warming Houses: Four outdoor skating rinks are open at Academy, Hawthorne, Hayek and Lakeview Parks. Warming house hours are 4:00-8:00 p.m. weekdays, and 1:00-8:00 p.m. Saturday and Sunday’s. Please call 377-4370 to inquire about bad weather cancellations. Parks and Recreation Brochures and Schedule of Events: The Parks and Recreation Department distributes a spring/summer brochure through the Community Newsletter that is inserted in the Freeborn County Shopper the last week of April. Copies of the brochures are also available at the Parks and Recreation office at the City Arena or you may download a pdf copy here. Program Registration: You can register you and your family for recreation programs Monday through Friday from 8:00 a.m. to 5:00 p.m. at the Recreation Office at the City Arena. You can now also register online. Registrations can be placed online using Mastercard or Visa. Fee Structure: Resident and Non-Resident Status: The City Council has determined all recreational activities will have a user fee charge. In addition, the City Council has determined non-residents will pay an additional $5.00 non-resident fee for each program. A non-resident is considered someone living outside the city limits of Albert Lea. Adult Programs Fee Structure: The fees charged for adult programs are the direct result of the calculation of the cost of the program. The entry fees assessed for adult athletics pay for the cost of officials, facilities, trophy expenses, state registration fees, and any other miscellaneous expenses.